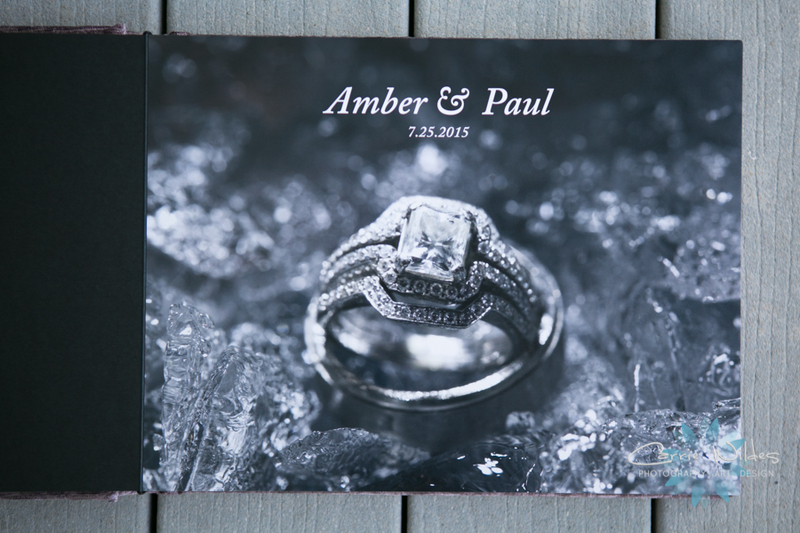 Amber and Paul chose this really awesome swirly velvet material for the wedding album cover! 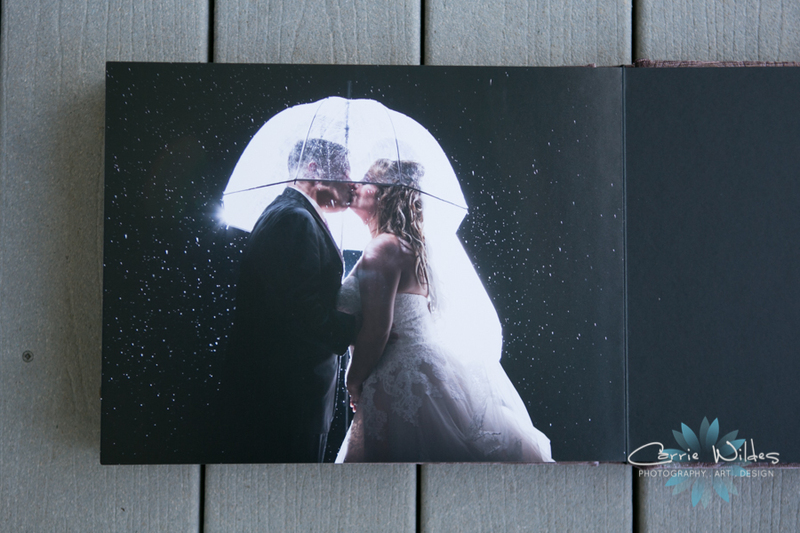 Some of our favorite moments were with Amber getting ready with her little girl, their first dance, and the amazing photo of them in the rain at the very end! 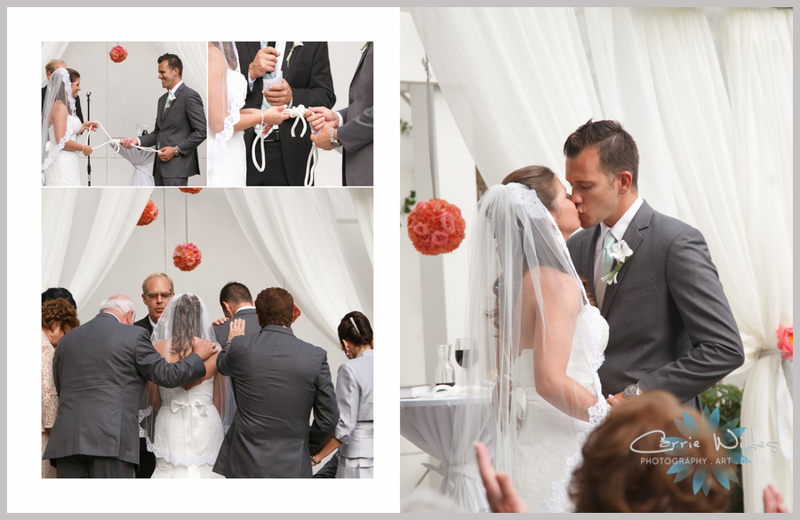 Lyani & Darren wedding story is made up of countless beautiful moments and some of my favorite surprises. 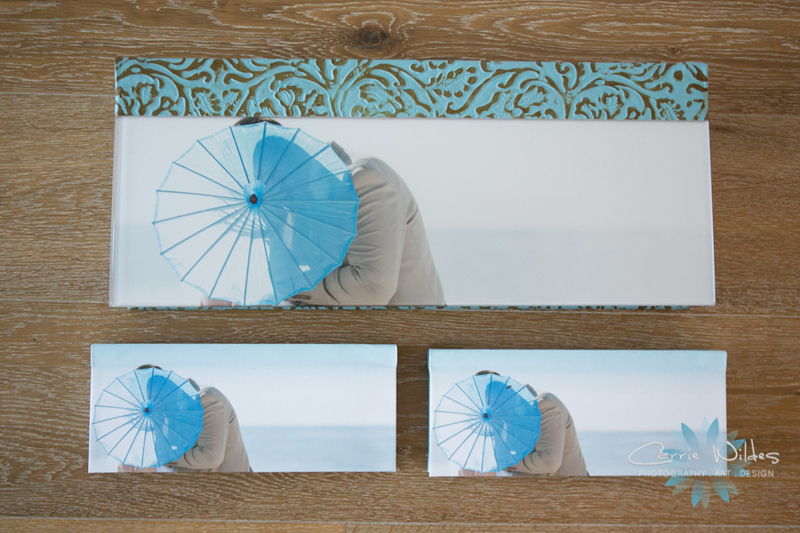 Lyani was at the very beginning of being pregnant which only a few people knew. Right after the ceremony the 2 of them went off for a moment and photographed them from a distance celebrating not only the beginning of their marriage but of their new little one as well. Darren has the gold medal for best surprise as Lyani thought we were going out for night photos and instead there was a surprise fireworks show. Such a beautiful story they will have for a lifetime. 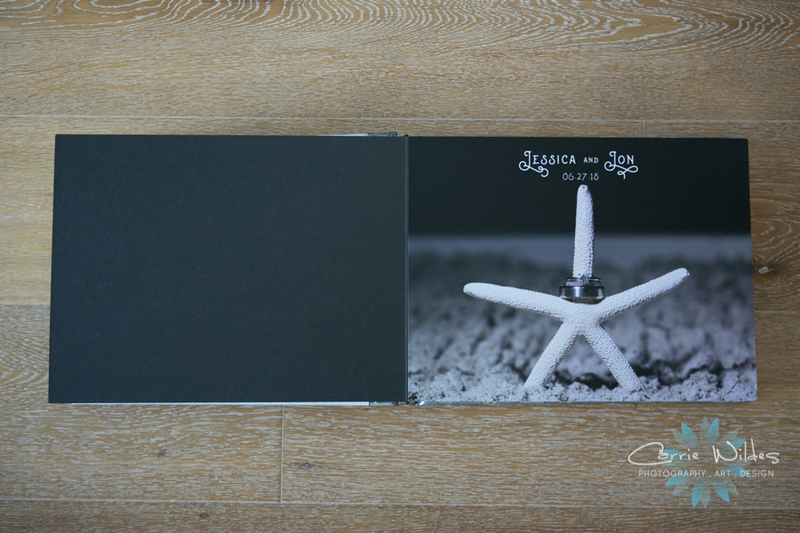 Take a little sneak peek inside just a few of their album pages below. Happy Thursday! 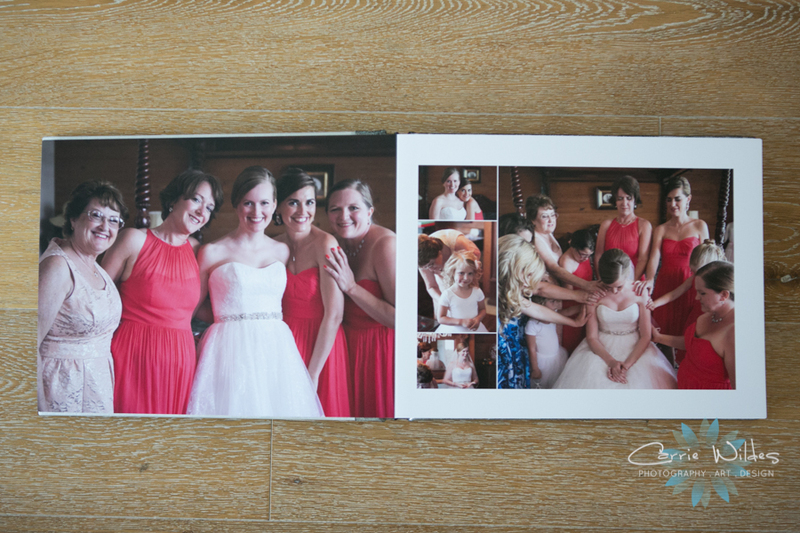 Just sharing a little album fabulosity from Jessica & Jon's wedding. 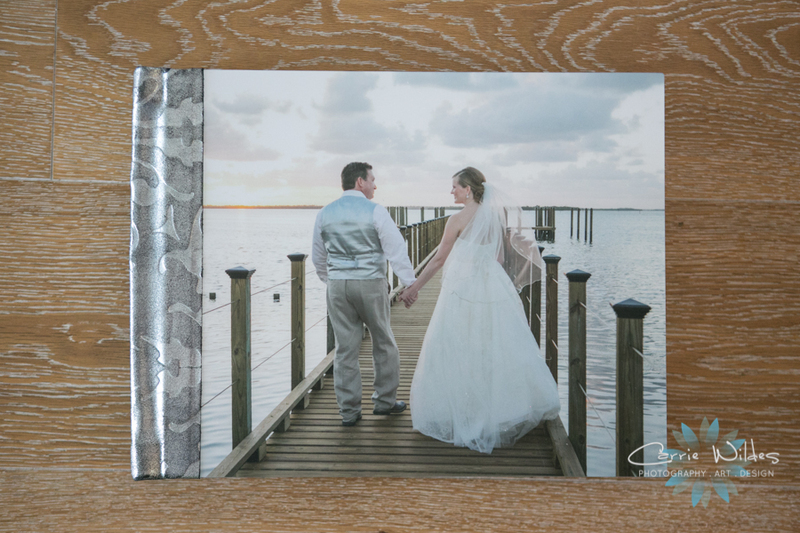 The photo of them walking out on the dock at sunset printed on metal looks gorgeous with the patterned silver leather. 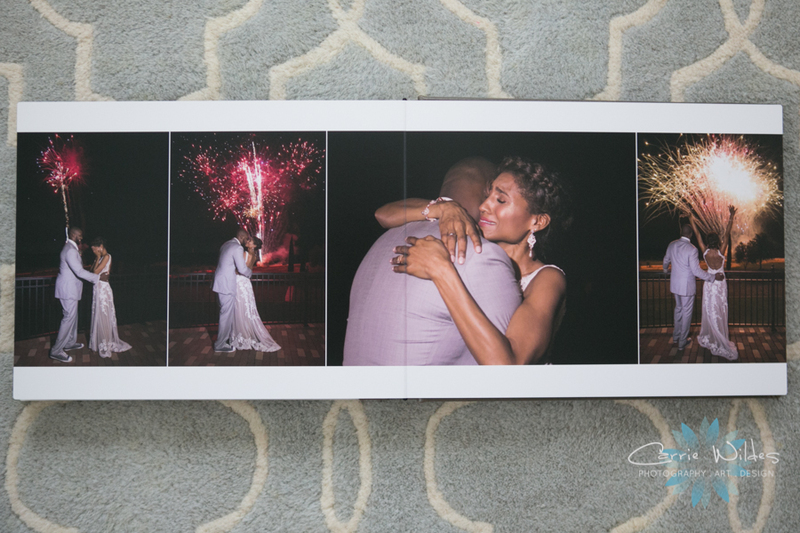 See below to take a peek at just a few of the inside spreads. This little beauty is in our office and will be on it's way home soon! 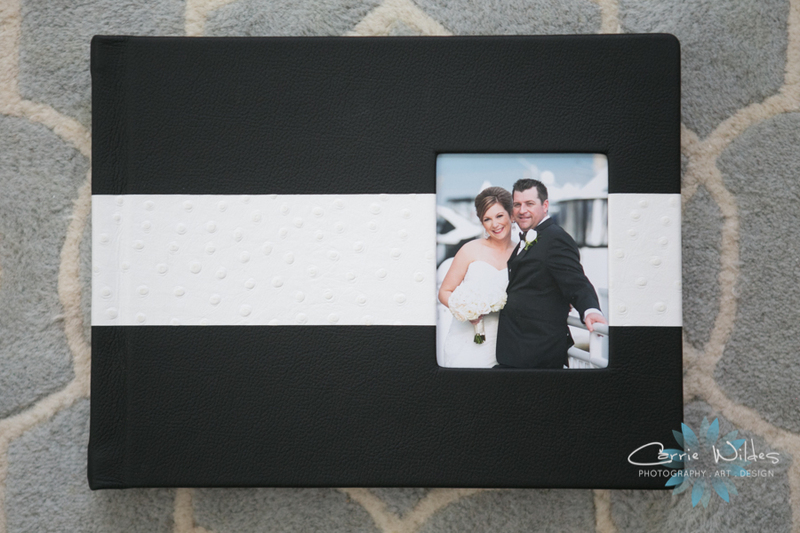 Candice and Steven chose a wedgewood blue leather and photo printed on metal cover for their wedding album. 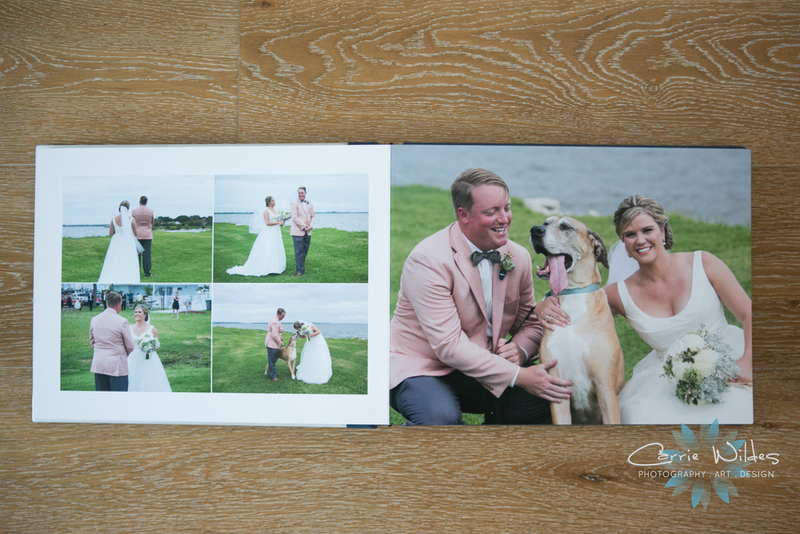 Some of our favorite moments were first look (including their dog Blalock:-) all of their amazingly unique details including the Taco Bus and hand made Florida mugs, and their sparkler exit to the water taxi. 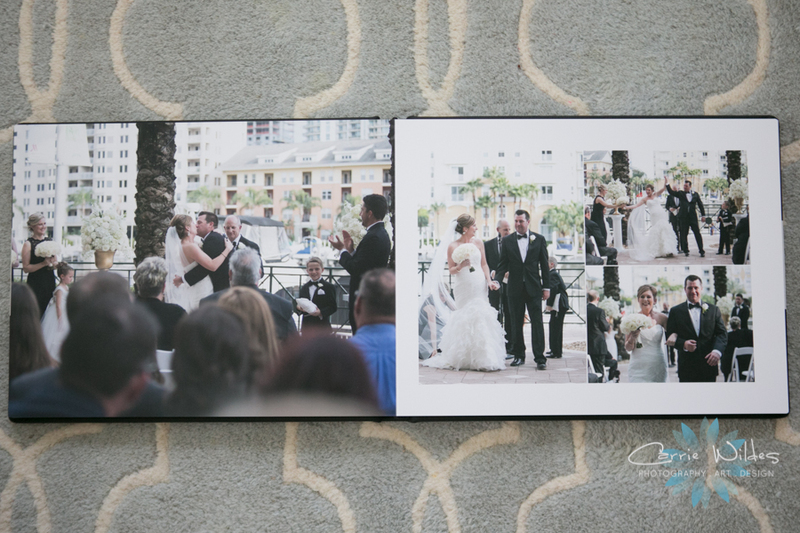 We hope you guys enjoy flipping through and enjoying your wedding story for years to come! 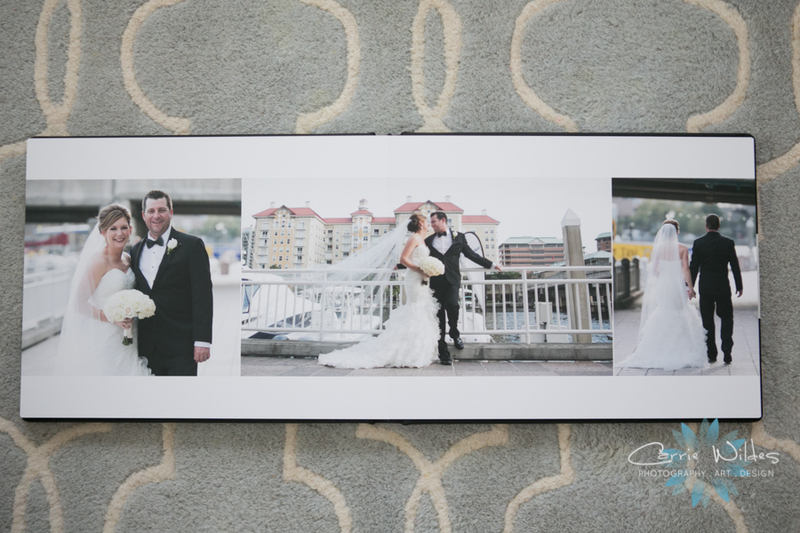 Our album obsession continues with this stunning, panoramic 20 in x 8 in wedding album we created for Sara and Anthony's wedding. 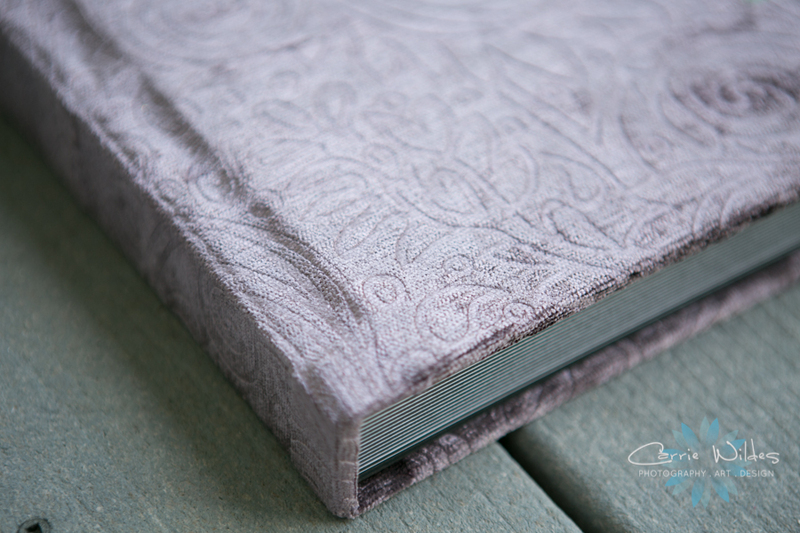 The cover is a metallic print underneath acrylic with a swirly aqua and bronze leather. Pictures really just don't do this one justice! The smaller ones are copies for their parents:-) This one you open from bottom to top and it's 20 in x 16 in when it's totally open. 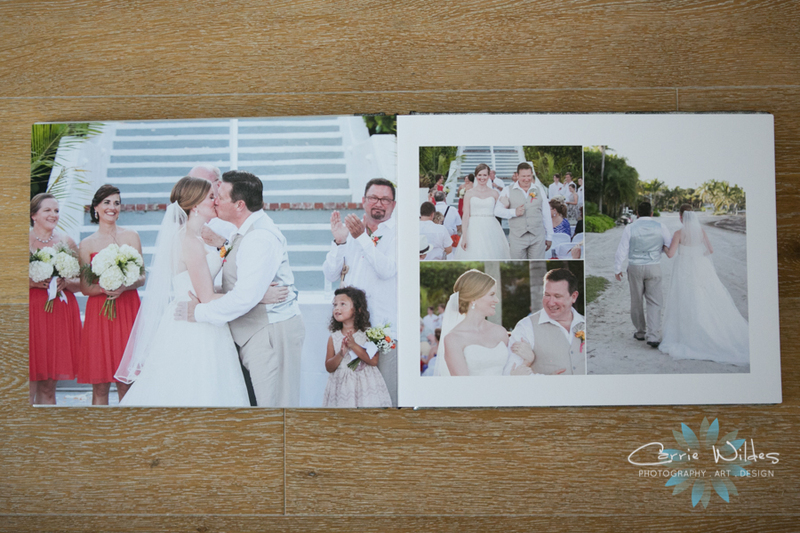 You can take a peek inside some of the pages below and we saved the beautiful Florida sunset for the very last page. 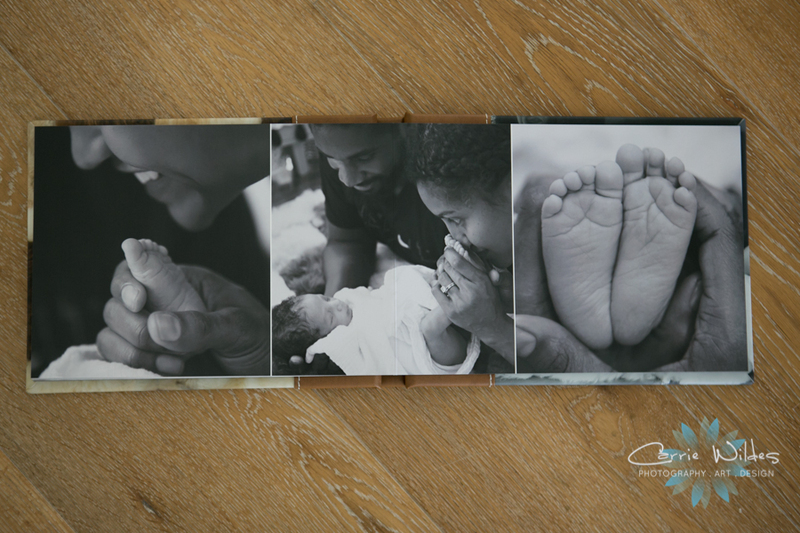 We love how the sweet moments of little 5 day old Matai with his parents turned out in print! 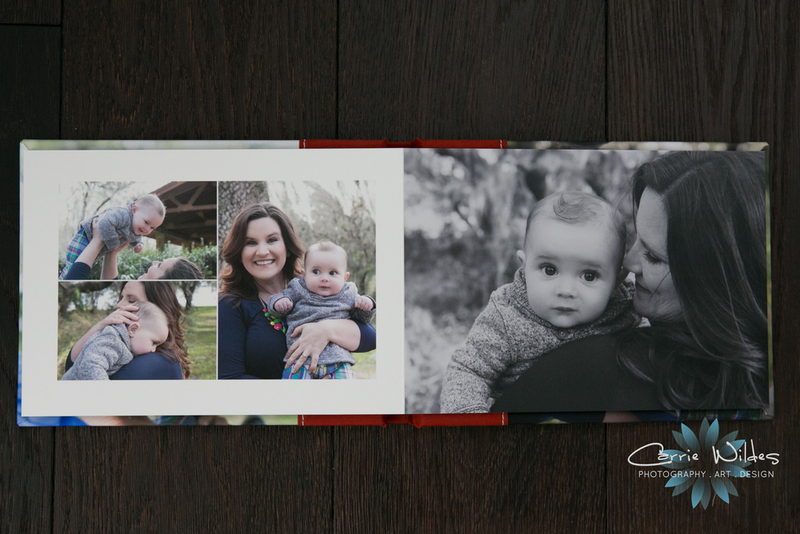 Here's just a couple of our favorite spreads inside their album. 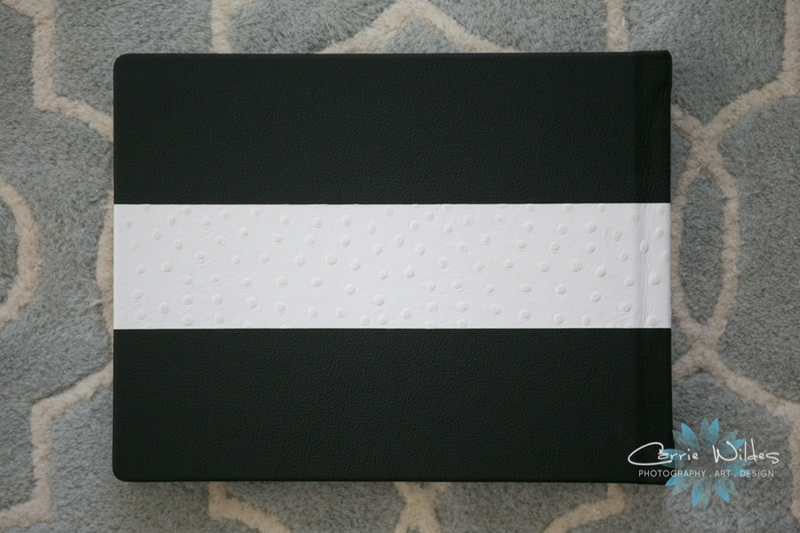 We just got a special delivery from the FedEx man! 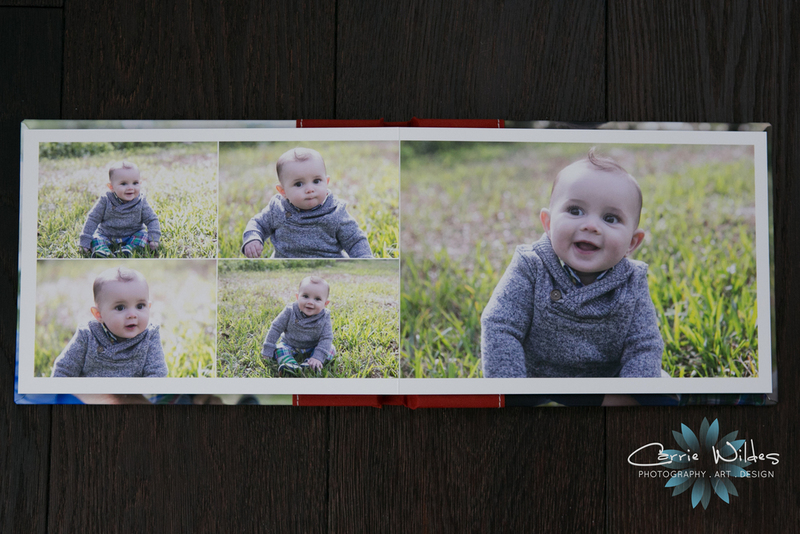 I think Ezra's parents are going to be in love with this sweet little face in print! 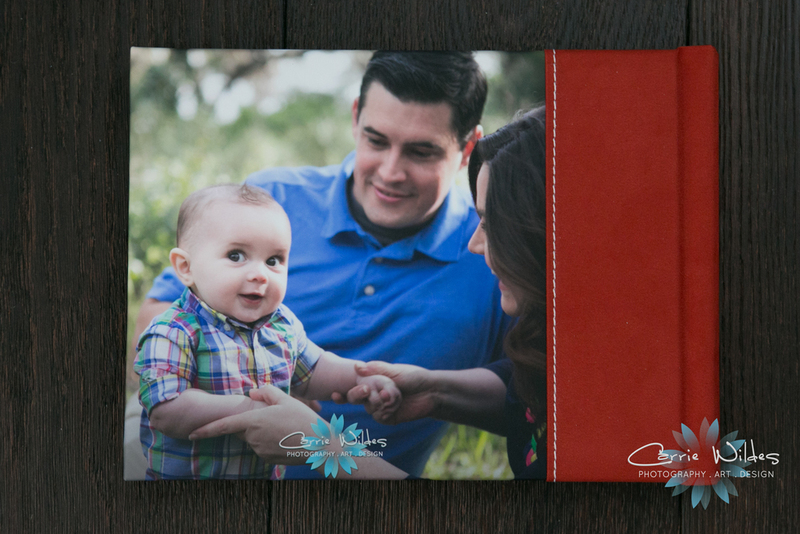 We designed a 10x7 custom portrait album from Ezra's 6 month session with a photo on the front and back, and a red suede accent in between. Here's a little peek at some of my favorite spreads look like too! These girls started the day off just having a blast and enjoying every minute of it! Lauren's flowers were wild flower-esque and her dress made it elegant and boots brought in the rustic. I say it all the time but the moment the groom sees the bride is always one of the best moments of the day. 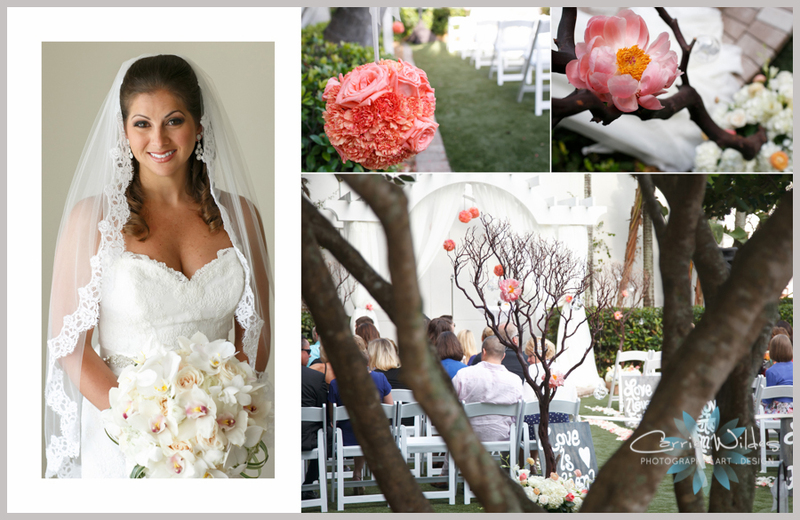 It was a tiny bit breezy, and the most beautiful scene of Lauren and Brian saying their vows under the huge oak tree. A little "before" of the reception and what it looked like filled with Lauren and Brian's sweet moments. 4 cds of pictures that were doing me no good but just sitting in a box in the closet. Fast forward 7 years to 2012 and that's still what they were doing. 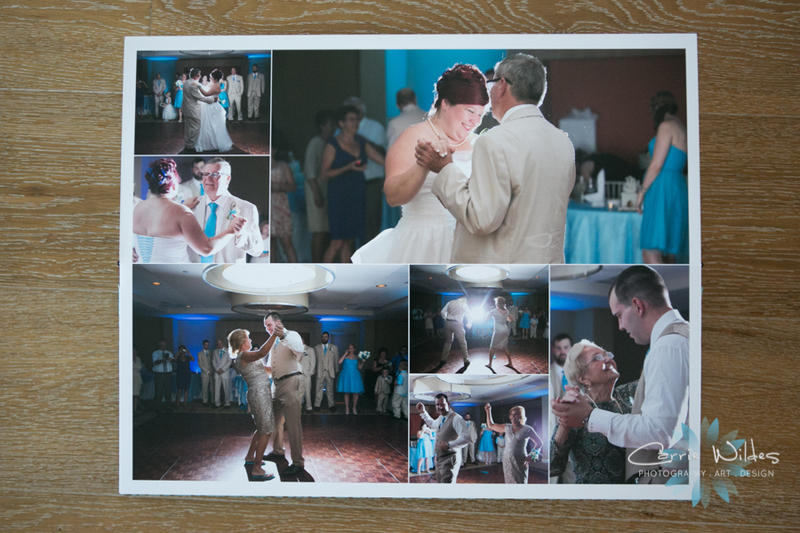 My husband David has even said "we don't even have an album from our wedding like your brides do", and he said that a couple years ago, so I decided that this was the year that I was going to actually do one for us, and I did for our 7th anniversary. Now, keep in mind I have had my amazing graphic artist Clay, on staff now for about 3.5 years so I have someone to design it for me and it still took me this long! 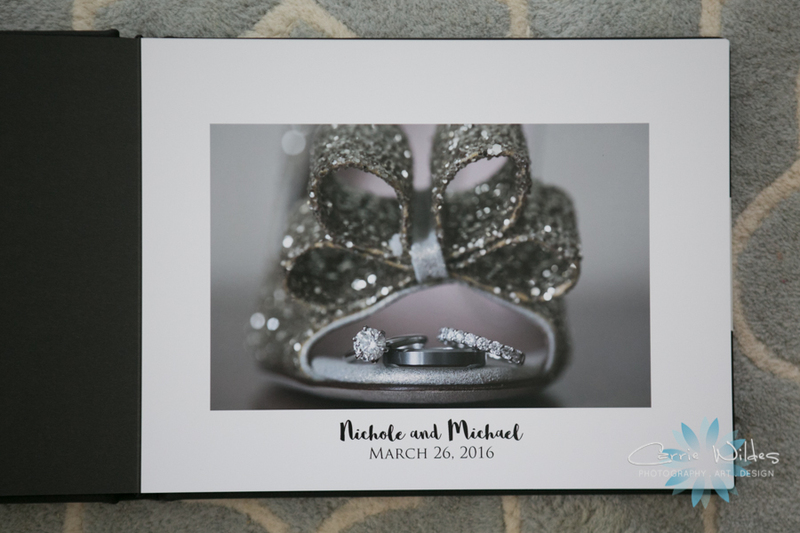 A lot of the wedding magazines tell you to get your high res images and you can make an album on your own, or that you don't need one. 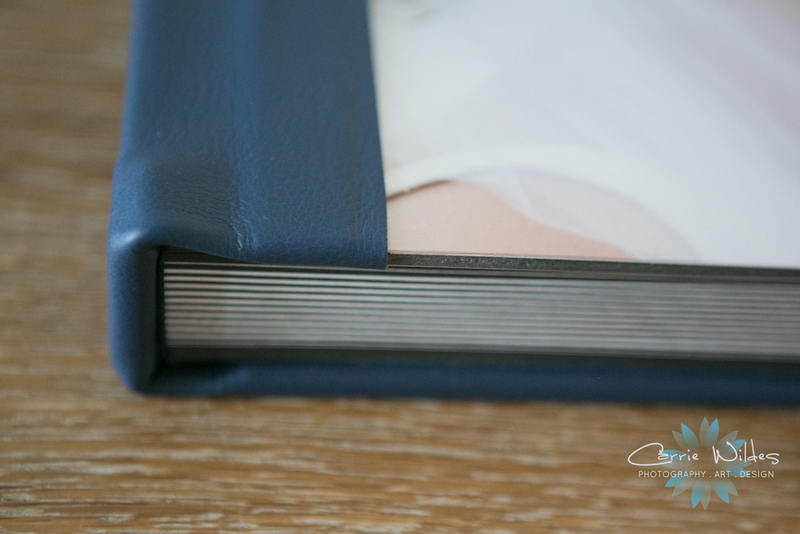 Well, you can make a book online from a consumer type lab but the print color will fade over time and they are mostly press printed books, not photo quality archival paper that are made to stand the test of time. But, like me, most of you are going to get busy with life and aren't going to do anything with those digital images. They are going to sit there on the cd doing you no good. So what will you have? When you are 65 are you going to sit your grandkids down and show them your wedding pictures on facebook? Probably not. Who knows what will be around then! You're either going to pull out your album and relive the funny things that happened, details, and all your loved ones who were there, or you are going to wish you could because you don't have an album to show them. In our family pictures in our album, both David and I have Aunts that were very dear to us that aren't with us anymore. David's Aunt Faye, who is his only Aunt and my Aunt Carol who was like my 2nd mom both passed away from cancer just a couple years after our wedding. But, we have them and our fond memories of them in our album. 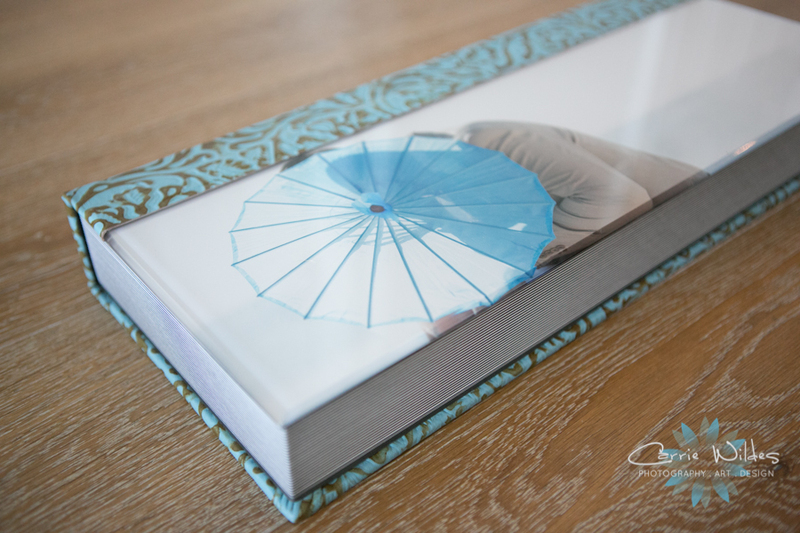 When are you thinking about your wedding photography and what you have left after, really consider a photographer who does these types of custom, gorgeous albums, even it isn't us, although I hope it is:-) It is so worth it and you will be so happy you did! I can now say that I have one finally! I had the design finished for our anniversary on July 3rd to surprise David, and just got our finished product in the mail a couple days ago. 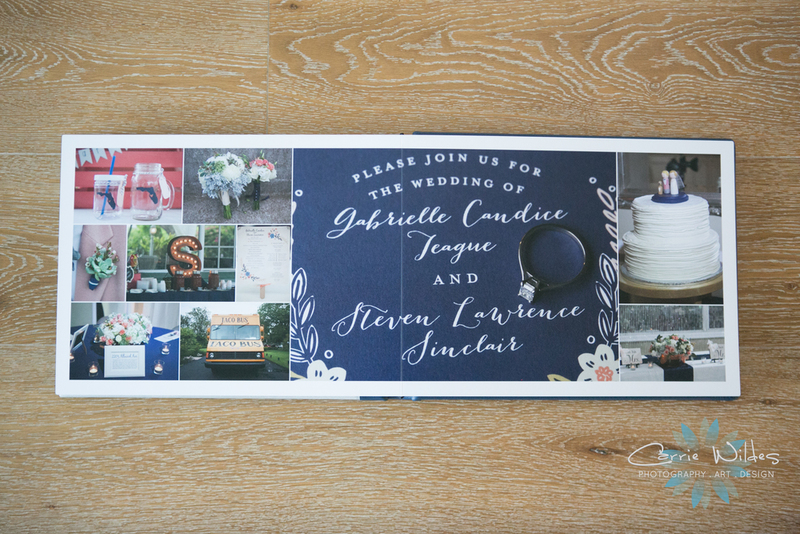 Our colors were light blue and ivory/peach so I did a blue leather with a band of silver that looked very nice with a b/w picture of us on the cover. 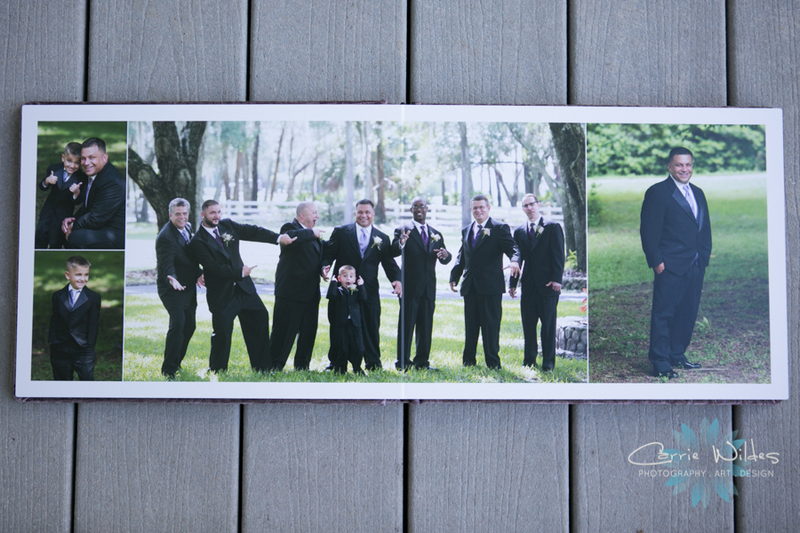 Here's what our finished design looks like so you can flip through and also some pics of it on our coffee table! 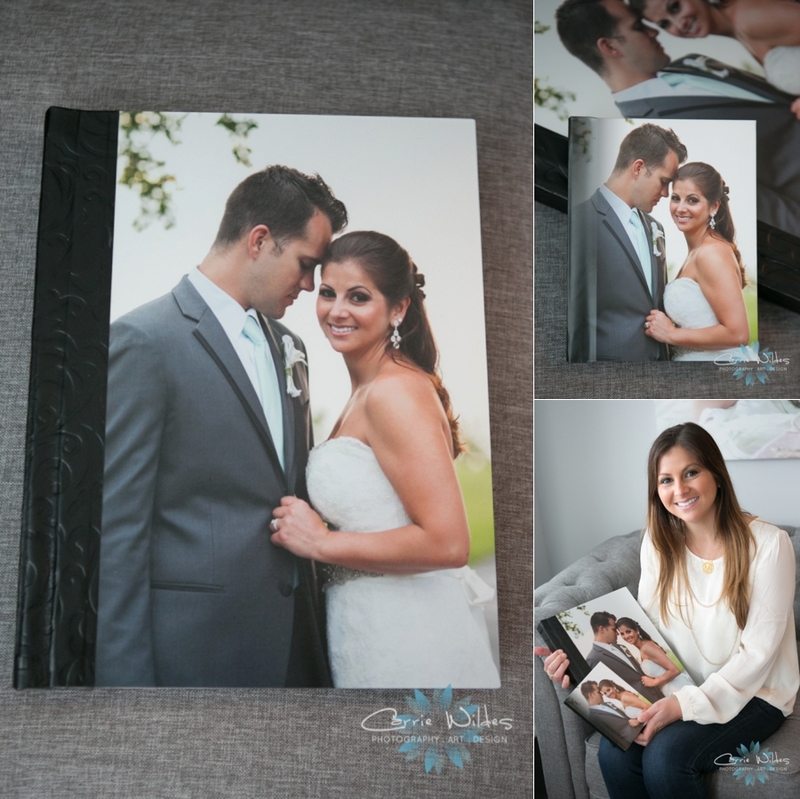 I LOVE when our couples get their wedding albums and see their story in print, they seriously are each a unique piece of artwork! 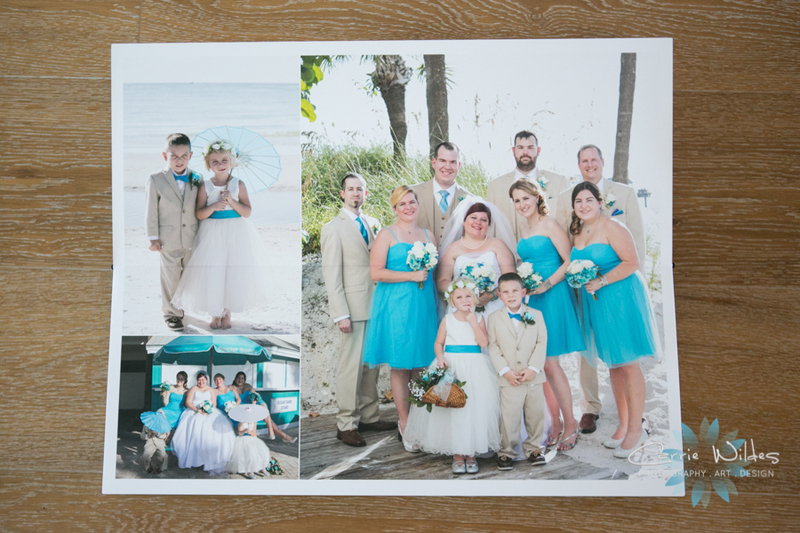 Audrey sent me a sweet note about how much she loved it, and I am SO glad we got to work with them!